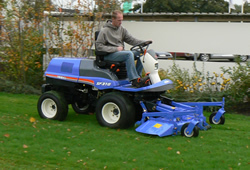 The SF370/310 Front Mower is designed for demanding professional users with large areas of lawn to maintan,such as local authorities,landscape gardeners,hospitals,residential homes,sports centres and schools. 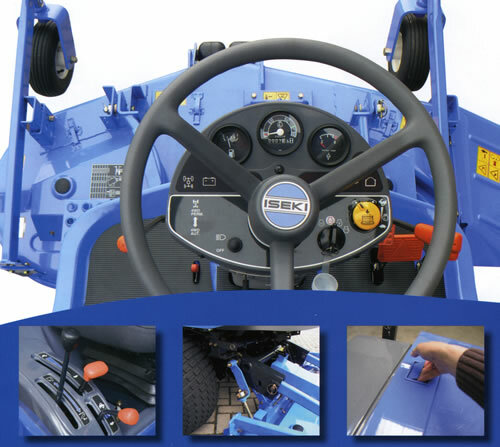 What these users are looking for is not onry a perfect cutting result,but also a machine that is tough,reliable,efficient and easy to use.All this without losing any comfort,safety and ease of maintenance.Let's find out how Iseki answers their demands. The SF370/310 has a large,powerful and durable engine (30 or 36hp).Thanks to large displacement it has high torque at low engine speeds. This machine is highly manoeuvrable,with a 47cm turning radius.Combined with the compact dimensions,this gives you the possibility to mow wherever you want. No more need to select the number of driven wheels yourself:the transmission is equipped with a modern automatic 4WD system that cuts in only when necessary,reducing wear on the turf.Wide tires to protect soft turf are available as an option. With a travelling speed of 21km/h,this mower works fast,and its large 48-litre fuel tank enables it to keep running all day long. Even under the heaviest conditions,the indestructible mower deck,featuring the latest mowing technology, delivers a perfect cutting result that keep the grass green and strong. 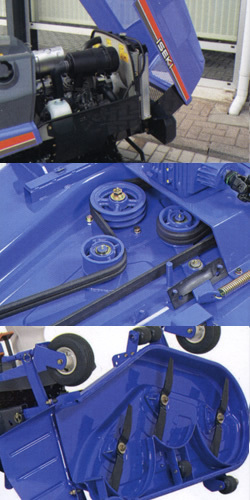 Efficiency is not only related to working fast,but also to minimizing downtime.This machine allows fast and easy maintenance:the operator's floor is tiltable,the bonnet is easy to open and the oil filler and fuel cap are within easy reach.As for the mowerdeck, without any tools it can be tilted more than 90 degrees or even completely removed.Greasing, checking belt tension and blade changes are all simplicity itself. 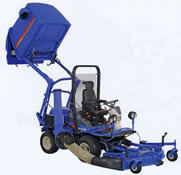 Investing in an Iseki mower is a guarantee of relability in itself. The SF370/310's robust design does not use a separate welded chassis,but is built around a solid cast-iron transmission housing.The extra-strong front axle can carry heavy loads and implements,even at high speed and on bumpy surfaces. 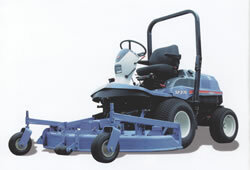 The mower blades are driven by a drive shaft PTO,a double V-belt and strong cast-iron pulleys.Not only is this construction highly durable,it avoids losing power by slippage and ensures a smooth and direct transmission. 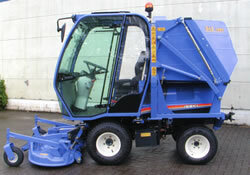 Iseki is famous for making its mowers comfortable and enjoyable to drive.Also for this machine,ergnomics have been given considerable thought: the dashboard layout gives a clear view of all important information,the controls and levers fall readily to hand and the steering-wheel angle is adjustable. The mower also features power steering and cruise control. To enhance ride comfort, the floating operator's position is mounted on rubber blocks,minimizing noise and vibration.The narrow steering post gives clear visibility of the front-mounted implement. The independent PTO can be engaged without having to depress the clutch and is controlled by an easy-to-use safety switch. The two-pedal drive system makes it easy to choose speed and direction.While on the road, the Iseki auto-throttle system increases engine speed automatically when needed. The mower's large alternator allows strong working lights to be fitted to improve visibility at the ends of the day. The operator is protected by a safe-start circuit,which means that the mower cannot be started when the power take -off is on,range gear is engaged or the operator is not in the seat. The PTO up-stop sysyem automatically disengages the power take-off when the implement is lifted.A Roll-Over Protection System(ROPS) is available as an option. To customize the machine according to your specific needs and demands,a wide variety of accessories and implements can fitted.These include a cab, grass catcher, brush,snow blower,salt sprayer and many others. Please contact your local dealer to discuss availability.